I've been a busy, beavering bee today and I'm so excited because I've got something to show you and it's a new free pattern. Woo hoo! 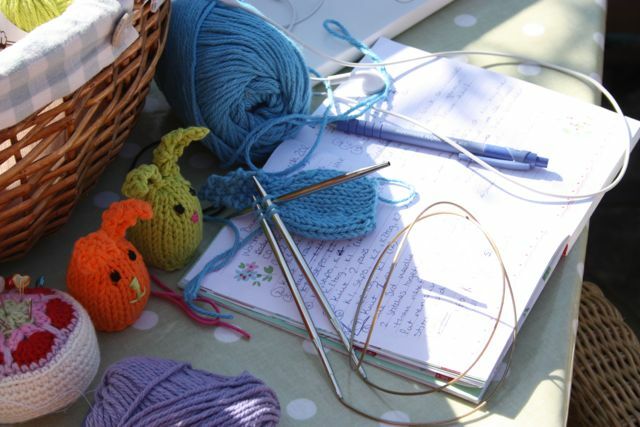 Yesterday I started making a teeny tiny little something for Easter, thinking I had ages yet to work on it. Then, after a 'who's doing what and when' type conversation with Hubs I realised that the school holidays are actually next week. Not the week after, as I had been thinking. Eeek! I had this little idea of spicing up our traditional Easter Egg Hunt this year with some little bunnies. The little bunnies would each be hugging a nice little Easter sweet treat, all safely hidden inside. So, armed with this vision and some rather vivid Lily Sugar 'n Cream left-overs I set to work on the pattern. As I only had the rest of this week with no prying Little Miss eyes around to spy what I was up to, I decided to spend this afternoon working on them. They came together quite easily. Well they are only dinky after all and after a little tweek or two, I had my production line in full swing. I'm not so very good at doing faces and after attempting a smiley bunny which I wasn't sure about at all I decided to stick to a simple little face for my egg hugging bunnies. Luckily for me, I think it suits them that way. However, you Clever Bods out there will probably be able to do something much more inspiring. Here they are all are though, holding their treats and ready to be hidden for some Easter Egg hunting fun and games. 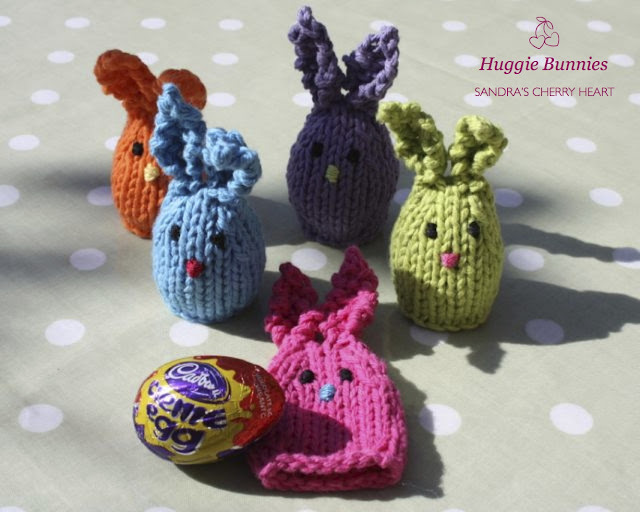 As you can see, they are just right for holding and hugging a Cadbury's Creme Egg, or some other equally delicious sweet confectionery Easter treat of about that size and I can't wait till Little Miss discovers them all, one by one. I hope you'll give the pattern a try. 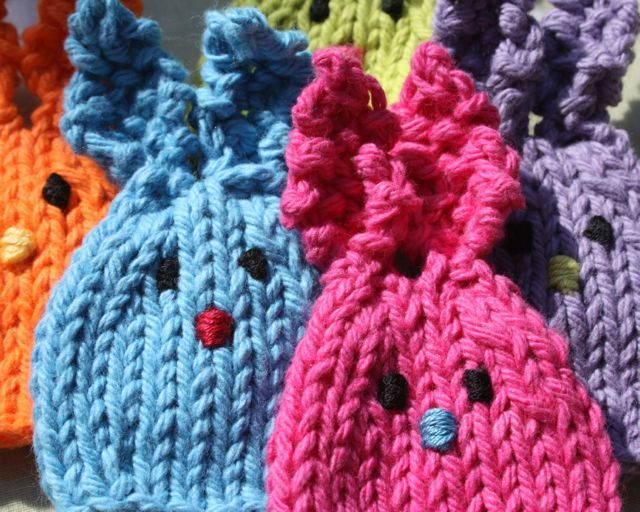 You could have your own Huggie Bunnie Easter egg hunt, or just use them as gifts or even real egg cozies maybe. 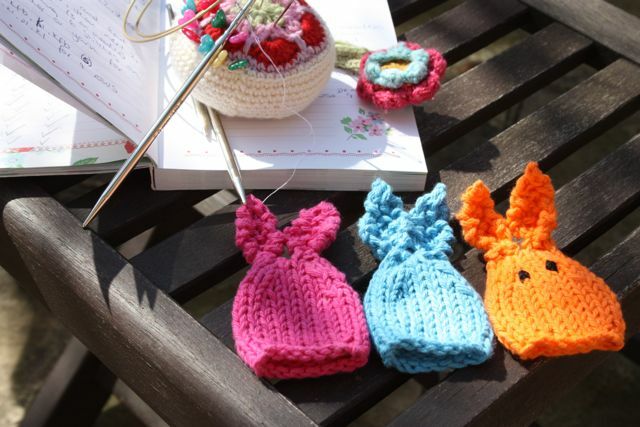 You can download the pattern right away from Cherry Heart's Boutique, on the 'Knit' page. I hope you like them as much as I do and happy hunting! So cute! Almost makes me want to learn to knit! Oh, these are so very darling! If I was a knitter, I'd definitely give them a go. Merhaba, çok şirin çok sevimli örgüler tebrik ederim..bende örmeyi düşünüyorum.. Brilliant!! You are so clever! Thank you for solving my Easter problem...Too many eggs and not enough cash! Absolutely adorable! 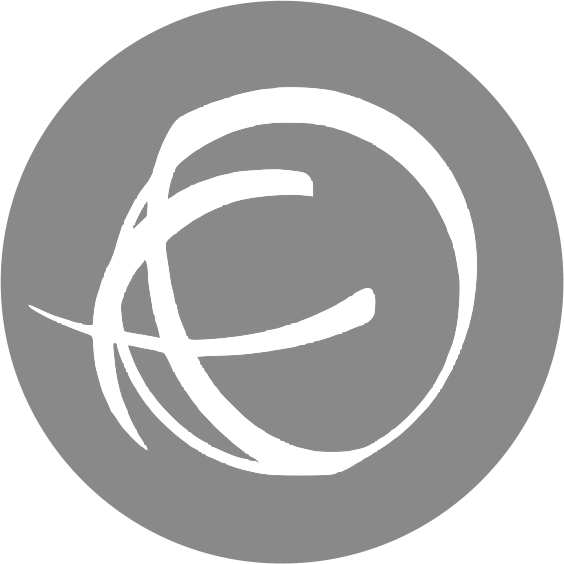 Thanks for sharing and your blog is very inspiring to me! Take care and have fun next week. These look so cute! 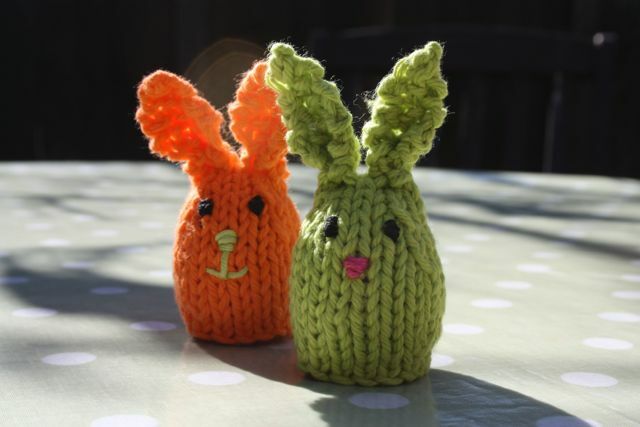 I wanted to make egg cozies too for Easter, but I don't think I'll find the time. Ah well, just looking at yours makes me very happy. They are so bright and colorful. Oh how cute are these little babies! They're adorable Sandra, and so clever ... a certain little Miss is going to have such fun!